Have you ever experienced that the colors of your photos does not seems to correspond to the colors of the scenes in front of you? 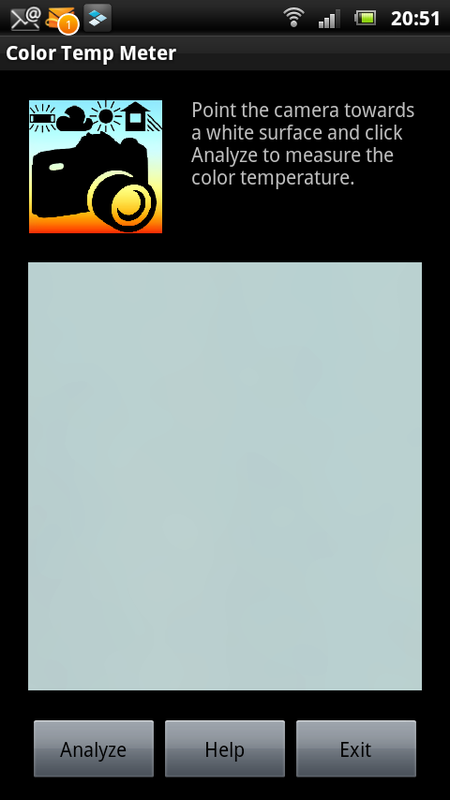 Let the Android app Color Temp Meter help you to get more realistic and better looking photos! Find a surface that is white or gray. A white paper with or without text works perfectly. Just make sure to avoid any colors. Point the camera towards that surface and click the Analyze button. 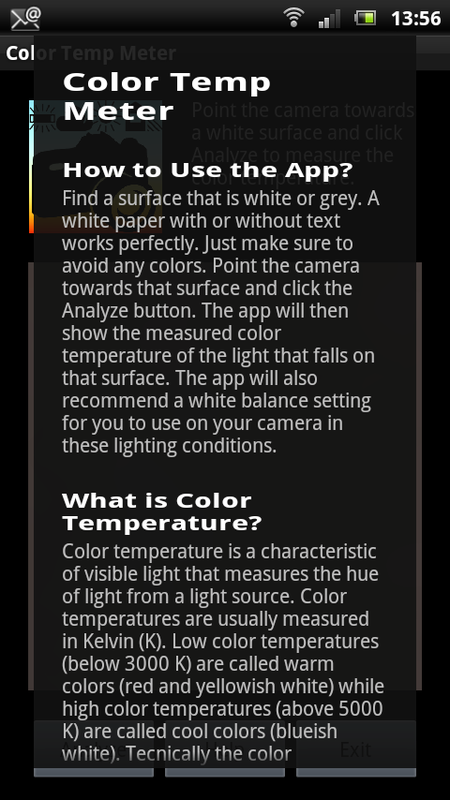 The app will then show the measured color temperature of the light that falls on that surface. The app will also recommend a white balance setting for you to use on your camera in these lighting conditions. Color temperature is a characteristic of visible light that measures the hue of light from a light source. Color temperatures are usually measured in Kelvin (K). Low color temperatures (below 3000 K) are called warm colors (red and yellowish white) while high color temperatures (above 5000 K) are called cool colors (blueish white). Technically the color temperature is the temperature of an ideal black-body radiator that radiates light of comparable hue to that of the light source. When is Color Temperature Important? Color temperatures are of special interest in all kinds of color photography. The human eye easily compensates for the color temperature of different light sources. Most cameras today have a feature called Automatic White Balance, AWB, which tries to do the same. In some conditions this works OK, in other conditions the results are poor. Many photographers therefore prefer to manually set the white balance value on the camera to match the color temperature of the current scene. With this application you can measure the color temperature before doing the white balance setting on you camera to get a more accurate setting. 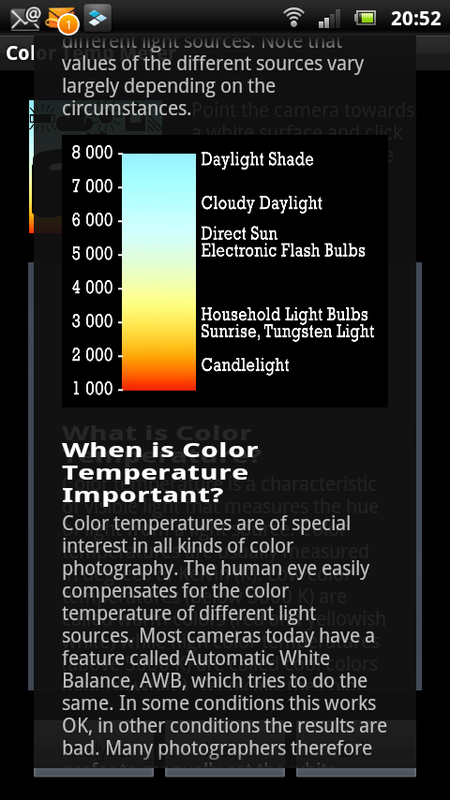 You can also use this app to learn about the color temperatures in your environment. With this knowledge you can develop a better understanding of how the color temperatures varies which helps you when you are trying to master the light and colors in your photography. To measure the color temperature accurately is a complex issue. On an Android device is it complicated further by the fact that all devices are slightly different from each other. See the measured values as fairly good approximations. Get your copy of the Color Temperature Meter on Android Market/Google Play by clicking here and start to measure the color temperature with your Android device right away!